Lunarmorph, a fashion parade like no other, will be accompanied by a 32 vintage synthesizer orchestra in the pit. Alternative fashion devotees & music geeks alike will appreciate hearing & seeing the machines that made the sounds of ‘Blue Monday’ and ‘Dr Who’ morphing with eye popping alternative fashion of the highest and most avant-garde character…totally befitting for Sydney’s first Fringe Festival. I will certainly be attending in my gothy finest! And earlier in the day I will don some steampunk wear for the Steampunk Symposium, also held at the Enmore Theatre. If you’re in Sydney you should come on down and see what the fuss is all about. It will surely be a spectacle. While many know the gentlemanly aspects of Steampunk, characterised by the debonair Kit, perhaps Airship Pirates and wenches have come to exemplify steampunk costume of late. See also my own Steampunk fashion shoot for Fiend from 09. 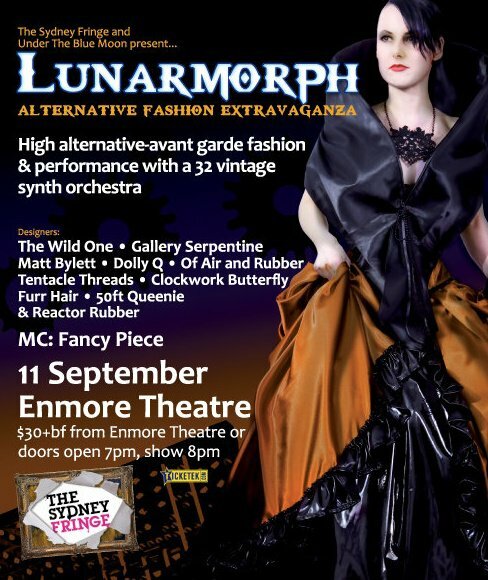 The Steampunk Symposium in the deco foyer of the Enmore Theatre will entertain you for the afternoon hours before Lunarmorph launches in the evening. Gentleman Adventurer, Stewart Rule & steam punk inventor, Sir Dij Dijor host this afternoon of strange contraptions from an alternative time stream – expect time machines, Tesla coils, steam punk sellers of ray guns and special guests to entertain you with steam punk burlesque and vaudeville. Prizes for the best steam punk costumes will be awarded! So there are 2 exciting things to get your teeth into, so to speak, and 2 more reasons why I LOVE living in Newtown! !